To get started, you simply stick the TarDisk Pear in your MacBook’s SD card slot like any ordinary SD card (it doesn’t stick out like in the image above and sits flush with the machine when inserted fully). The installer software is supposed to launch automatically, but I had to open it from the SD card itself which was recognized and popped up inside Finder after inserting. There are a few steps to go through (more on that below), but all the formatting happens behind the scenes, with the entire process taking me around 50 minutes with a few clicks of the mouse and a few restarts. Requirements: You’ll need a MacBook with an SD port, 8GB of free space (at least temporarily for the installation), and Bootcamp partitions aren’t officially supported. After starting the installer, it then prompted me to turn off encryption on my internal drive by switching off FileVault and to enable Core Storage (you can enable FileVault again once Pear is installed). A little over half of the installation time mentioned above was spent on turning off FileVault and Core Storage with a couple restarts in between. I already had a recent back up, so the install time will vary depending on what your current setup is, how long your backup takes (the company not surprisingly recommends running a full backup first), and whether or not you run through the recommended steps to check the health of your current drive, remove BootCamp if installed, etc. You shouldn’t have to think about TarDisk much after installing it. The idea is that it merges with your internal drive so you can use it as if you have just upgraded your internal drive, and I found the process went smoothly. In my month-long test I didn’t run into any issues with my upgraded storage, and I didn’t find a noticeable difference in performance overall on the original, 2012 Retina MacBook Pro I tested it on. The new logically merged volume is managed by OSX. Internal SSD is primarily used before data is sent to the product. More frequently used files are maintained on SSD hardware. TRIM enabled SSDs maintain original speed benefits of Trim. Read/Write buffer (“swap-space-equivalent”) is maintained on SSD to buffer writes to files located on the product. Failure modes, if ever encountered, allow for direct restoration from TimeMachine backups. 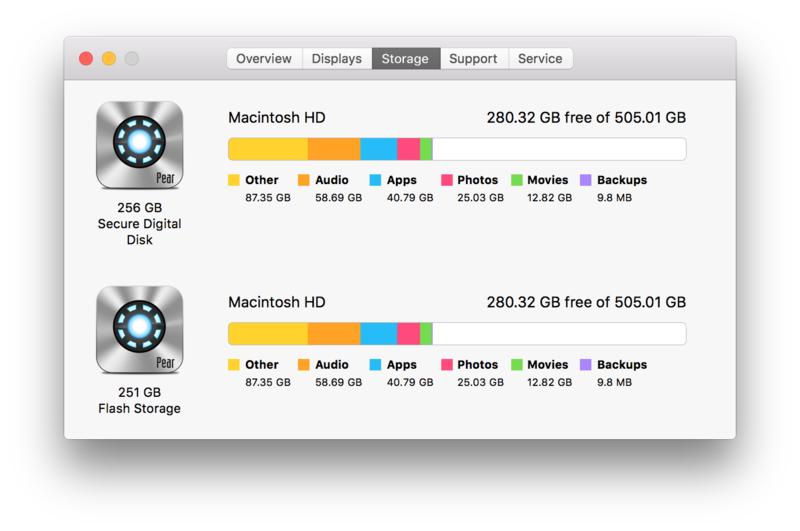 Disk Utility allows users to format drives and since OS X 10.8.3 create DIY Fusion drives, but the entire process is a one-click step with TarDisk’s installer software handling everything for you. Since the TarDisk Pear works like one drive in combination with your built-in storage, you won’t see the SD card mounted in Finder anymore. And you’ll be able to manage storage in the same way you manage the built-in storage in your Mac. Once installed, you’ll see the new drive appear under “About this Mac” and System Profiler (as pictured above). 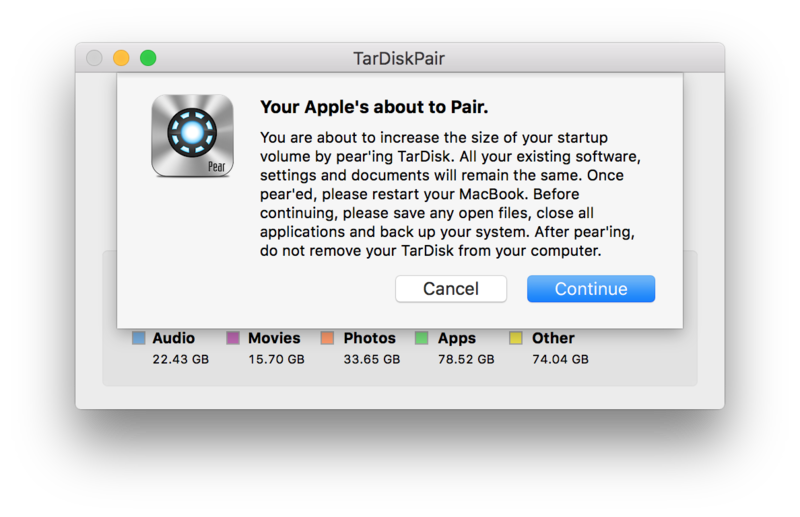 Out of all the options for upgrading the storage on an old Mac— a standard SD card, an external drive, or upgrading the internal drive— the TarDisk Pear proved to be the easiest overall solution. If you can deal with the pricing ($149 to $399) and the available storage and speed options, and you don’t want to put up with the mess of upgrading internal drives on Macs, then I’d recommend TarDisk as the easiest, although one of the priciest, approaches to upgrading your storage. 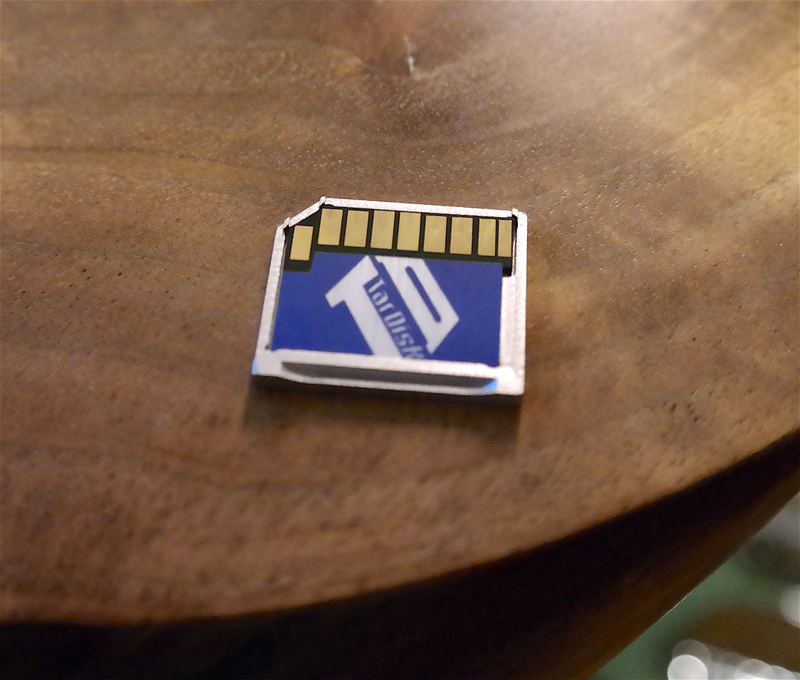 The TarDisk Pear is available now in 128GB ($149) and 256GB ($399) versions. It’s compatible with MacBooks that have an SDXC port and Yosemite or El Capitan installed. Update, Apr 14, 2016: 9to5Toys has a 15% off promo until May 5th.